The latest illegal firearm seized by police bringing to 49 the number of guns seized so far for 2017. Guyanese police have so far seized a total of 49 guns so far for the year, with ‘A’ Division leading with 19 seizures, police said. 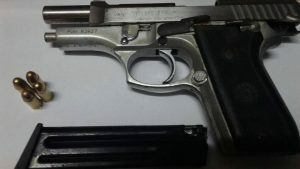 The latest gun seizure was made on Tuesday, May 16 at about 6 PM at Norton Street, Werk-en-Rust, Georgetown where police said they took away one .32 Taurus pistol and four live rounds of ammunition. Police said the man then escorted them to his home where a search unearthed and live .38 ammunition and 3 ½ grams of cannabis were found in a room. The mechanic and his 50-year old mother, who was at home at the time, have since been arrested. In terms of gun seizures for the year, police also said 16 were seized in ‘F’ Division; six in ‘C’ Division; four in ‘B’ Division; three in ‘D’ Division and one in ‘E’ Division. Last year, police took 109 illegal firearms off the streets compared to 115 in 2015. Fore 2016, the illegal weapons included 9 pistols, 32 revolvers, 26 shotguns, two rifles and one sub-machine gun.